I printed out the following visuals found HERE at Finch Family Games. I did have to pay $1.00 to download them but in my opinion, worth it. I printed out pages 2 - 16 on card stock and placed them in plastic cover sheets. Before Primary hang up verse one visuals on the chalkboard using tape or magnets vertically down the left side of the chalkboard, in order. Place the 2nd verse vertically down the right side of the chalkboard, but out of order! Attention Getter: As you sing (or play the song on CD) ask this question: 1. Who is the child speaking to? [Heavenly Father] Sing or play it again and ask this next question: 2. How many times is Heavenly Father's name sung? Proceed to give a personal experience about prayer or ask if any of the children have had their own prayers answered. For Senior Primary, I will have them draw lines (using chalk) from the first verse card to the corresponding second verse card that is out of order (a matching game). Then sing both phrases - first verse and then the 2nd. Make sure to note to the kids that these are the first and second verses of the song even though the melody is completely different in each! Go on to the 2nd phrase in the first verse and find it's match in the second verse and so on until all cards are matched, gradually adding on each phrase as you sing it. Note: There are 8 cards in the first verse and only 7 in the second verse so one card in the first verse will have 2 cards that are its match. For Junior Primary I will simply add-on with the visuals. I'll have a child come up and hold the first phrase of the first verse. We'll sing it and then add on until we've sung all the cards to both verses. Then we'll gradually remove the cards out of order. See how I practice the parts together HERE. 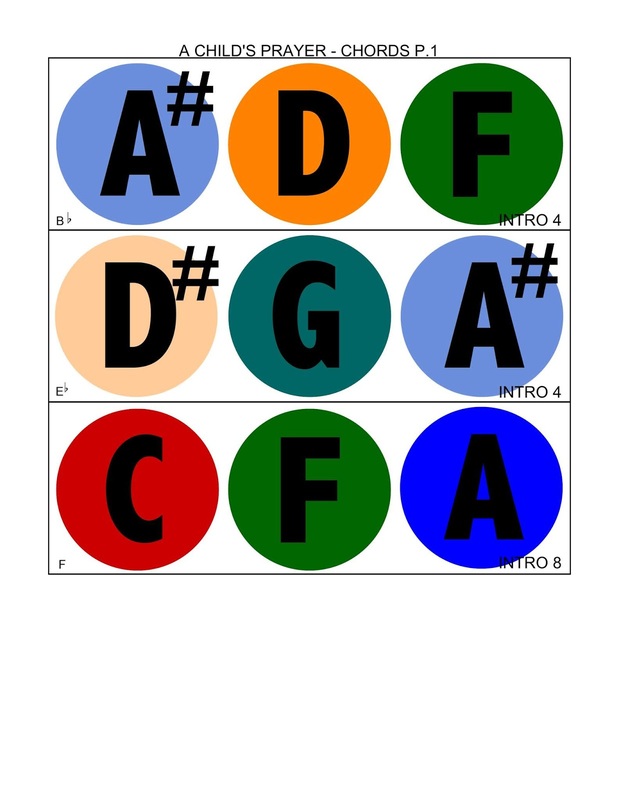 I also have a handbell chart using chords that you can find HERE. There's a good video HERE that you should watch, just for kicks ;)...it's with the composer, Janice Kapp Perry. Hey, Camille! I follow your blog and I just want to say thank you for all your great ideas! I am trying to put together a CD for the 2013 primary songs and I need help! I found the MP3 files on the church website but when I click on them it just plays the song. I'm not sure if I need to convert the files somehow or what. Do you have any expertise in CD making? :) I am going to check out your blog again and see if I can find anything helpful on here. My email is rebecker3@gmail.com or I will check back and see if you got my comment. Thanks so much! Scroll down until you see the list of songs. I right clicked on the song's icon I wanted under "MP3 Music and Voice", then selected "Save Link As" and then saved it to my computer. I just did it and it works fine...I don't know what else to tell you. Thank you! That was exactly what I needed! I've been burning my CDs tonight and it worked great! Id like the pictures for this song, but the website you sent us to no longer exists. Is there anyway I could buy the pictures off of you? I updated the post so the link now works. I hope that helps!